For most of his tenure as President of North Vietnam, Ho Chi Minh lived in a modest stilt house behind the grandiose Presidential Palace in Hanoi. Painful memories of French rule were too fresh in the Vietnamese people's minds; the French Governors General who lived in the Palace were among some of the most hated people in Vietnam, and Uncle Ho was not eager to follow in their footsteps. A visit to the northwest of the country in 1958 inspired Ho to commission a traditional stilt house for his personal use. When the Army architect submitted his plans to Ho, the leader requested that the toilet included in the design be removed, as it was too much of a departure from the traditional stilt house design. Two small rooms, no toilet - and what Uncle Ho wanted, Uncle Ho got. The President of North Vietnam moved into the small house on May 17, 1958, and lived there until his death in 1969. To this day, the stilt house (known in Vietnamese as Nha San Bac Ho, "Uncle Ho's Stilt House") can be viewed by visitors to Hanoi, Vietnam who want to get a better look at the life of Vietnam's founding father. Where is the Stilt House? : Part of the Presidential Palace complex, you can visit the stilt house here (location on Google Maps). Thus the legend of Ho Chi Minh and his stilt house goes, or so the Vietnamese authorities would have us believe. Undoubtedly, Ho did his utmost to cultivate a down-home, "man of the people" personality that contributed in no small part to his mystique as a leader. Official propaganda shows Uncle Ho living the simple life even as President, wearing brown cotton clothes and sandals crafted from used car tires, much the same as his fellow countrymen. There was a reason for this myth-making at the time: the North Vietnamese were undergoing serious difficulty due to American bomb attacks, and the people needed to be shown that the top brass was also feeling their pain, and carrying on nonetheless. "Uncle Ho's Stilt House" goes a long way in burnishing this legend. While its propaganda value continues to this day, the stilt house behind the Presidential Palace is worth visiting if only to glimpse the setting within which North Vietnam decided its strategy for the duration of the Vietnam War. Hanoi Heartbeat: Read about Must-See Hanoi, Vietnam sights. The stilt house was constructed in a corner of the Presidential Palace's gardens, in front of a carp pond. It looks nothing more than a wooden house set on stilts, perhaps less weathered and better constructed than its traditional counterparts, but still affecting a simplicity that seems better suited to servants' quarters than the President of a country. To reach the stilt house, you'll have to walk from the Presidential Palace visitors' entrance on Hung Vuong Street, and follow the crowds or your designated guide down a 300-foot-long path from the Presidential Palace, known as Mango Alley, which is lined with trees bearing the fruit that gives the path its name. The path skirts round a sizeable pond on the grounds, which is stocked with carp. The pond is part of the stilt house legend - Ho Chi Minh used to summon fish to feed with a single crisp clap, and the carp in the pond are said to respond much the same way today. Reasons Why: Undecided? Check out our top reasons to visit Vietnam. The house is set in a well-cultivated garden, set with fruit trees, willows, hibiscus, flame trees, and frangipani. The garden can be reached through a low gate covered with climbing plants. A path leads to the rear of the house, where stairs lead upward to the house's two rooms. The walkway encircles the house, but access to the rooms themselves are barred. The two rooms are small (about a hundred square feet each) and contain a bare minimum of personal effects intended to convey the simple tastes of the man who lived within. Ho Chi Minh's study is small and spare - the room is furnished with his typewriter, books, some newspapers of his day, and an electric fan donated by Japanese communists. The sleeping quarters contains a bed, electric clock, an antique telephone, and a radio donated by expatriate Vietnamese in Thailand. The empty space under the house was used by Ho as his office and receiving area. Foreign dignitaries, Party officials, and generals would visit Ho under his house and sit in simple wooden and bamboo chairs in the company of their leader. A rattan armchair in one corner was Ho's favored resting spot, where he would catch up on his reading. The space contains a few concessions to the ongoing war: a group of phones that served as hotlines to different departments in the government, and a steel helmet as protection against a possible bombing raid. 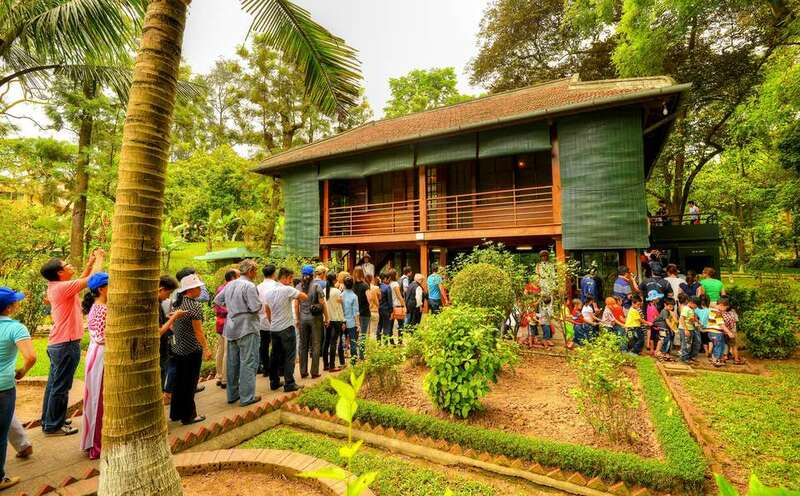 The rear of the house is notable for its riot of fruit trees - milk fruit and orange trees dominate the grove, along with over thirty species provided by the Ministry of Agriculture, selected to represent trees grown throughout Vietnam. Good behavior: Read about Vietnam dos and don't's. The fact that American bombers made constant runs on Hanoi throughout the duration of the Vietnam War thins the legend of a President relying only on the protection of a steel helmet and his sheer force of will. The propaganda machine tells us that a nearby bomb shelter named House No. 67 was used primarily as a conference area, and that Ho preferred to sleep in the stilt house. The reality must have been more prosaic - House No. 67 probably served as Ho's residence in fact throughout the dark days of the war. Still, it was probably much better lodgings than the Hanoi accommodations another figure had to contend with during the war years. Future US Senator and candidate for President John McCain was shot down over Hanoi, and spent six years in Hoa Lo Prison in Hanoi's French Quarter. War is Hell: Read about other Vietnam War sites of interest.